How do German citizens perceive climate change? 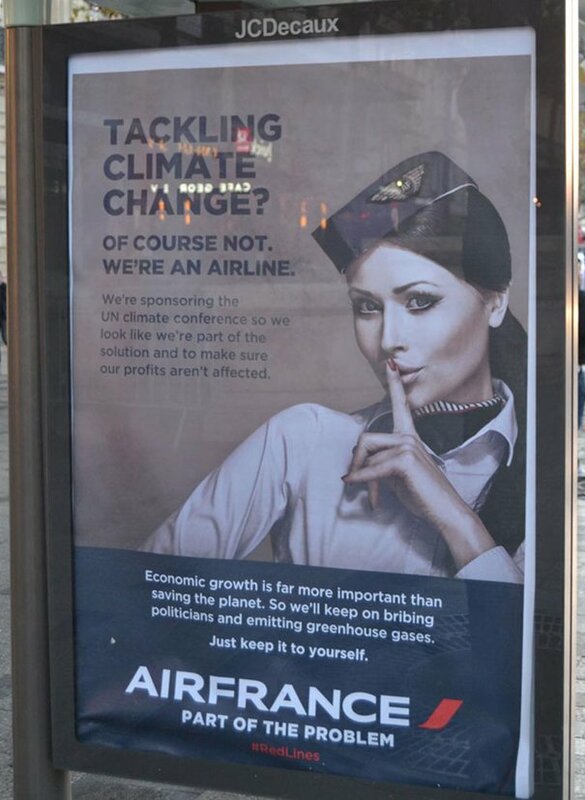 What do they know about climate politics? And how do they evaluate national and international efforts against climate change? Within the framework of our “Down to Earth” study, we aimed to answer these and further questions with an online survey with more than 2000 persons, conducted in Germany two weeks before this year’s climate conference in Paris. We outlined the study’s main results in a short research report (in German) which can be downloaded here: Working Paper “Before the COP21: How Germans evaluate climate politics, what they think and what they know about it”. Wie nehmen die Deutschen den Klimawandel wahr? Was wissen sie über Klimapolitik? 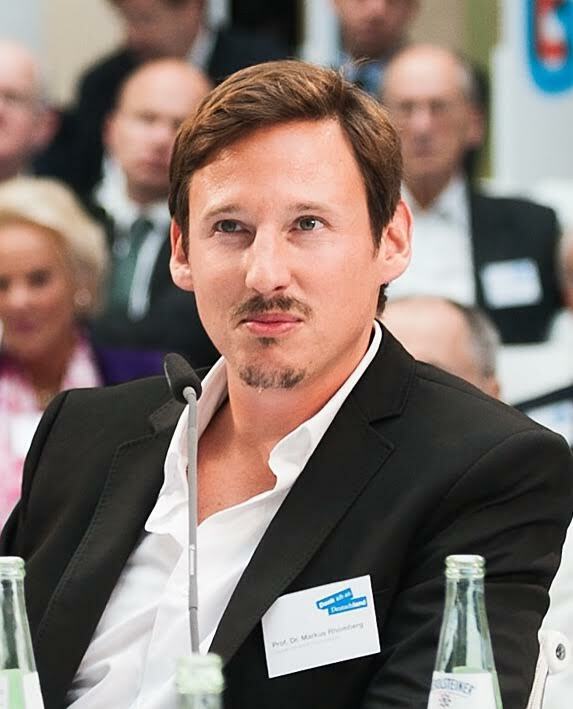 Und wie bewerten sie nationale und internationale Bemühungen im Hinblick auf die Bekämpfung des Klimawandels? 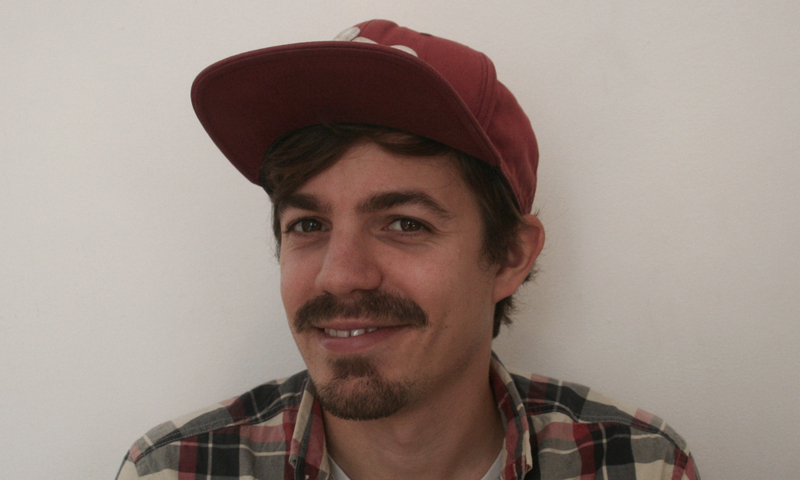 Diesen und zahlreichen weiteren Fragen sind wir im Rahmen unserer Studie “Down to Earth” in einer Online-Befragung von mehr als 2000 Personen – durchgeführt in Deutschland zwei Wochen vor der diesjährigen UN-Klimakonferenz in Paris – nachgegangen. 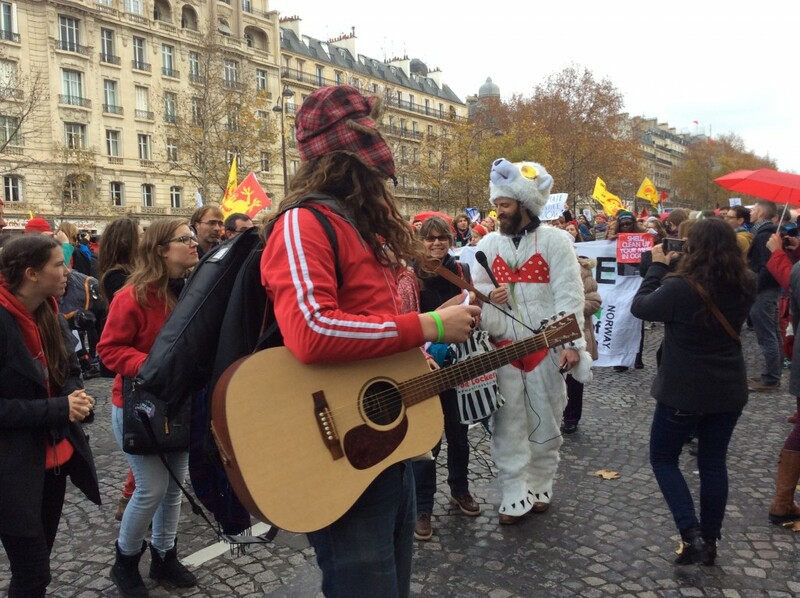 What can Google Trends tell us about COP21? COP21 in Paris ended on Saturday night with a global pact to reduce emissions and keep global warming below two degrees. It was the first time that all 196 participating countries agreed on such a deal and as such now is a good time to reflect on the eventful two weeks. While it is too early to be enthusiastic, from my perspective the Paris agreement is an important and essential step in the right direction. Many scientists see the agreement as a surprising success but they leave to us whether this “historic achievement” (Lord Stern) will be a binding contract for the future. For that to occur, at least 55 parties which produce over 55% of the world’s greenhouse gasses, must become party to the agreement. This post will examine possible directions the debate will shift in the coming years. I will analyse and critically reflect on media coverage from COP21 and focus on public attention over time, based on data from Google Trends. Google Trends is a public web facility that provides information how often a specific search-term is entered into the Google search screen relative to total search-volume. The data is presented as a score between 0 and 100. Google Trends cannot present an absolute number of queries but the search interest could be seen as an indicator for public attention on different topics or terms. However we should interpret the data carefully and should use the tool more like a starting point for research in the field of communication science. Figure 1 (below) shows the search interest for the term Climate change over the past three years. We can see some ups and down in 2013 and 2014 but overall the attention stays at a low level. On the right end of the figure, with the start of the COP21, the search interest reaches its maximum. We can therefore reasonable assume that the conference in Paris had a big influence on the public interest about climate change. If we look back on the past climate conferences in Warsaw (11.11-23.11.2013) or Lima (01.12-12.12.2014) we cannot see any attention peaks. Here we can ask, for example, if the public agenda is more affected by the event itself or the media coverage which usually increases during the events? Further, we should look at what other factors influence Google Trends? Figure 2 shows a comparison for the search terms Climate change and Paris agreement for the last seven days. We can observe a rise of the search-interest for both terms in the crucial period of the conference. The public started to google Paris agreement with the beginning of the last day of the conference just after the participants defined this term and also after the announcement that an agreement between the participating countries is realistic. These developments also affected the public attention for climate change in general. The decreasing search interest at the end of the conference could be explained with the issue attention cycle. Climate change will be replaced at the center of public awareness by different issues like the conflict in Syria or the refugee crisis. 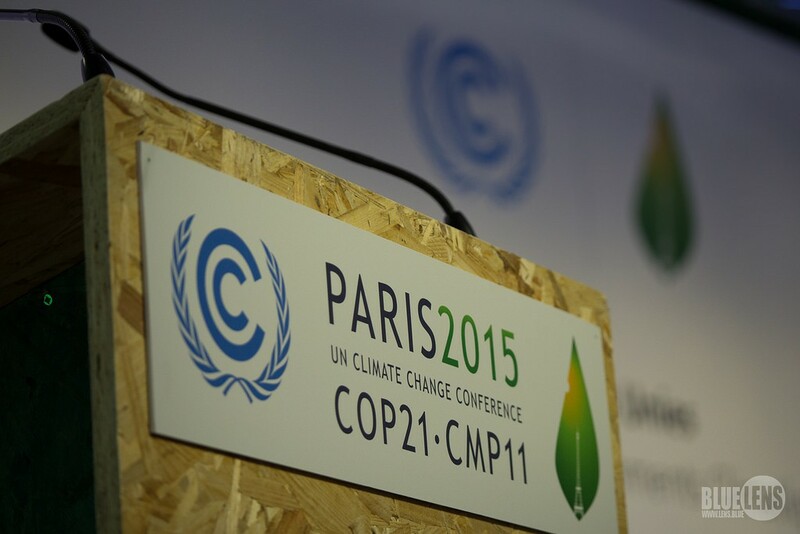 When 196 nations met in Paris for COP21, the event naturally attracted global attention. It also fostered transnational debates on Twitter. The Internet and more specifically social media enable many-to-many communication without the limitations of physically doing so, e.g having to convene in one geographical location. I wanted to find out the extent to which COP21 had “gone global” on Twitter. Besides this rather specific question, I was also interested in the general impact of COP21 on Twitter. 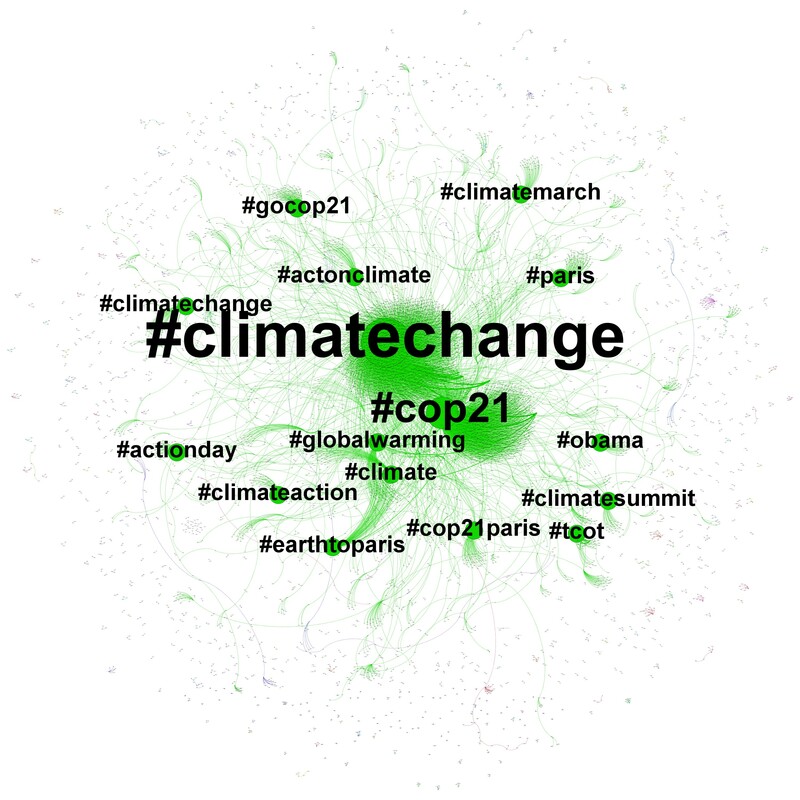 Over the last two weeks, I tracked all tweets containing the keyword ‘COP21’ in their text. In total I captured 4’505’988. In terms of tweet volume it was a good start for the conference. On Monday the volume reached a first peak of more than 55’000 tweets in one hour (see Fig. 1). Twitter extra created new emojis for the Paris Climate Conference: Whenever a user used the hashtag #COP21 the logo was automatically shown in the tweet. Fig. 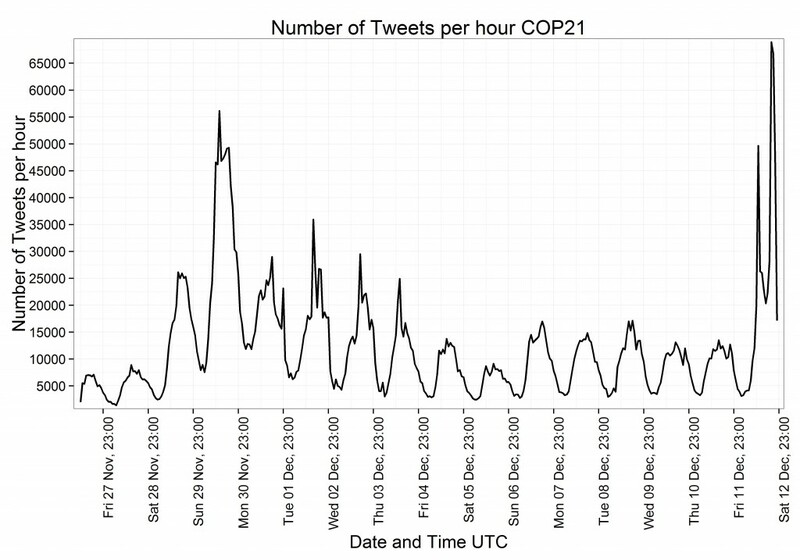 1: Tweet volume per hour of tweets containing ‘cop21’. During the first week the tweet volume went down compared to prior to the conference. In the second week the tweet volume was almost as low as pre-conference levels. However, on Saturday with the announcement of the Paris agreement, Twitter exploded again more than 65’000 Tweets in one hour. With such a large data set, many aspects can be analysed. As Warren Pearce has shown in his blog post, a typical analysis can focus on the hashtags being used in tweets. As a first step, I also focused on hashtags contained in tweets, but I was ranking them based on the number of unique users who used the hashtag. The number of times a hashtag appears in a tweet can sometimes be misleading, because a hashtag might be only used by a few bots (machine controlled accounts) that constantly tweet. 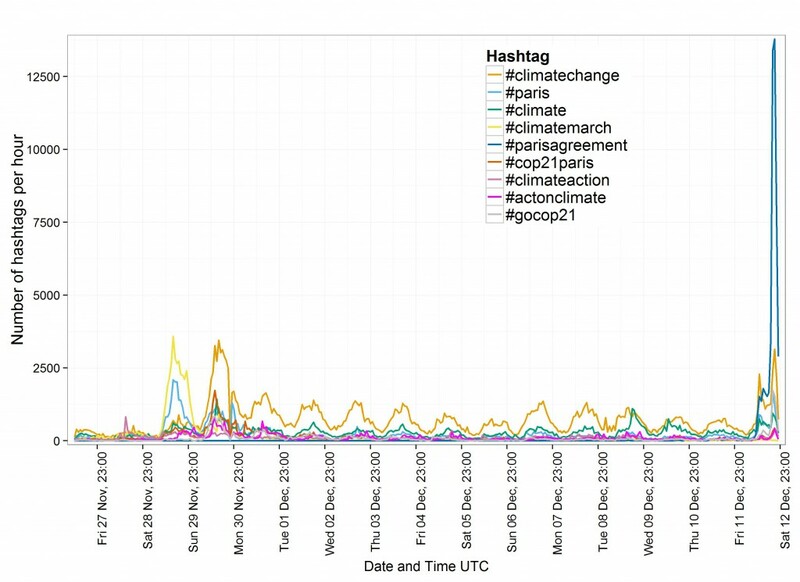 Not surprisingly #cop21 was the most used hashtag before #climatechange and #climate (see Fig. 2). Fig. 2: Hashtag word cloud. The larger the hashtag, the more unique users have used it during the last 2 weeks. #COP21 as the most popular hashtag has been removed. We can see above that #parisagreement and #climatemarch were used by a large number of users. Therefore, the next step in my analysis was to see when these hashtags were used. Fig. 3: Hashtag volume per hour for the most used hashtags. 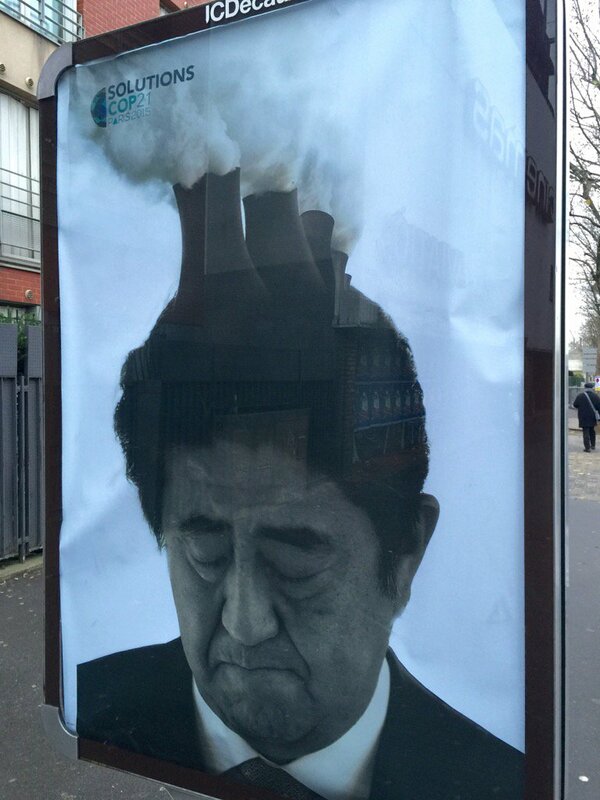 #COP21 was excluded. On the one hand the hashtag #climatemarch was popular on 29. November just one day before the start of the conference in Paris (see Fig. 3). 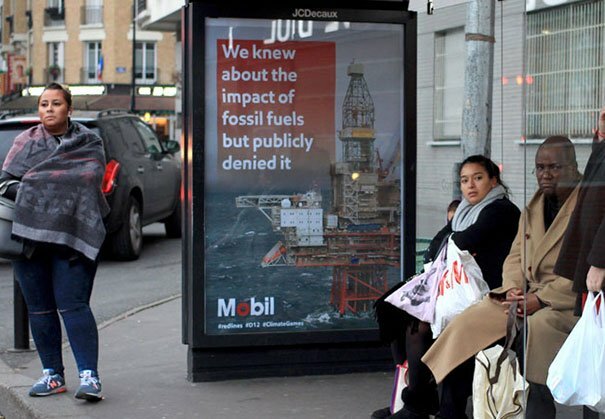 On that day the NGO AVAAZ organized a global climate march in many cities around the world in order to put pressure on leaders before the start of the conference. Only on that day the hashtag was trending. On the other hand #parisagreement was popular on 12 December when the first draft of the agreement was published and peaked after the announcement of the final agreement at the end of the conference. Overall most tweets were retweets (63.7%) followed by single tweets (29.7%) and replies (6.6%). Only in the first week during specific hours replies had a higher volume than single tweets and retweets (see Fig. 4). On closer examination it becomes evident that most replies were sent from @COP21Direct an account extra created for a Twitter campaign: If enough users per day use #COP21 in their tweets a 3D printer in Paris would print the logo of COP21. 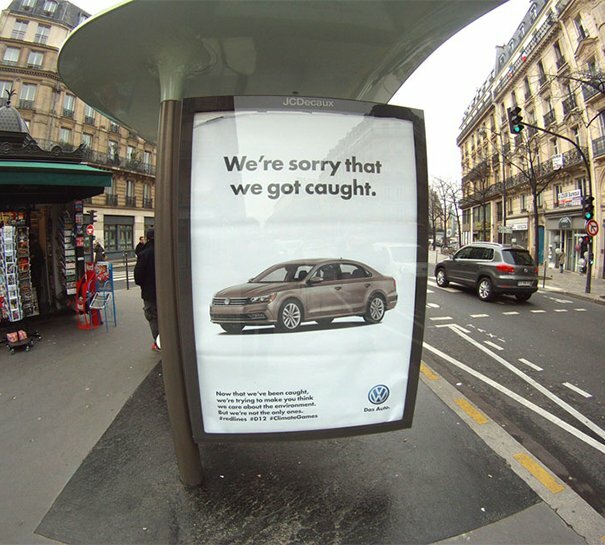 @COP21Direct sent automatic replies with a link to the video stream covering the printing process to all users that used the hashtag. Every day the printing process could be observed over a live stream. Fig. 4: Tweet type volume per hour. 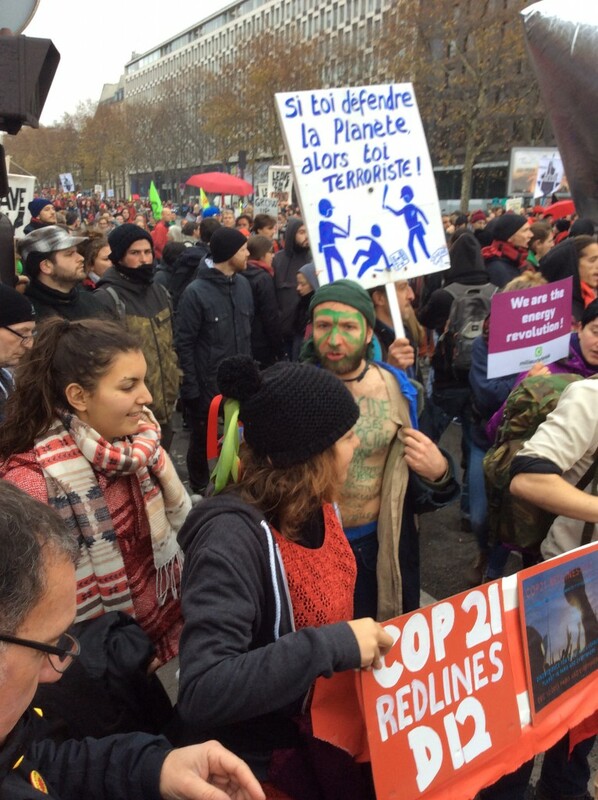 Some users quickly questioned if it is an official poster of www.solutionsCOP21.org, but the journalist thought it is a legit one, because it has the official logo of COP21 in the upper left corner. 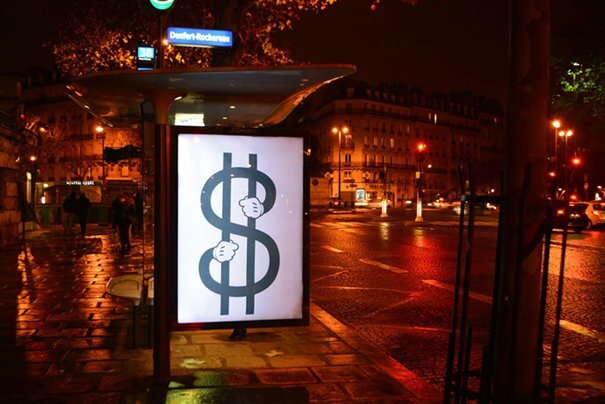 A user finally directs him to the webpage of Brandalism: artists in Paris used fake ads to protest against the corporate sponsorship of COP21. Thanks to Twitter this local protest even reached the Japanese Twitter sphere. The analysis of the retweets already exemplifies the potential of Twitter to connect users around the world. In a next step I focused on the geo location of the users. The location of a user can possibly be determined with geo tags, but only few users are using them. In my data set only 0.1% of all Tweets contained a geo tag. Still, the location field in user accounts can be used to identify the exact location of a user. Users can freely choose what text they want to enter in this field. 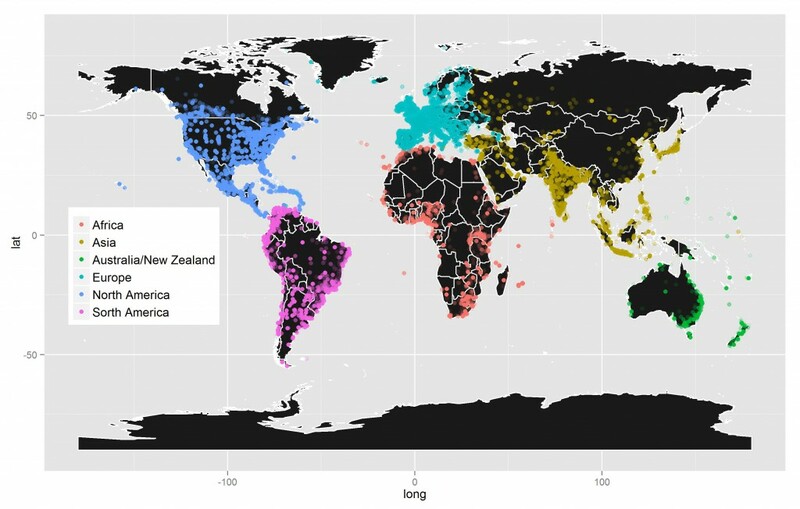 For every unique user (937’613) in the data set text from the location field was compared with a data base of cities and countries. For 34% of all users the coordinates could be identified with this method (See Fig 4.). Fig. 4: The denser the colour, the more users are from the same city or country. The analysis shows that users from all around the world tweeted about COP21. Around 16% of the users were identified from the USA, 15% from France and around 9% from the UK. Users from India (3%) were also well represented. Overall users from almost 200 different countries could be identified. The same can be observed with the language of the tweets. Twitter automatically detects the language of a Tweet. Around 52% of Tweets are in English, 27% in French, 10% in Spanish and around 2% in Japanese. First of all, Twitter typically reflects the real world events around COP21. 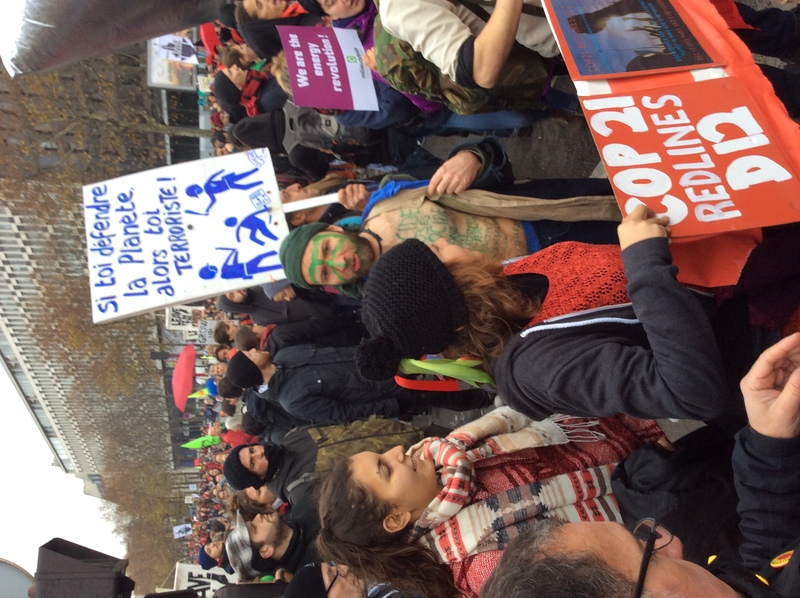 The hashtags clearly indicated when the climate march took place and when the Paris agreement was finally reached. Secondly, during the event many different methods of digital campaigning were used such as live streams, flooding twitter with the help of bot accounts and online campaign pages asking users to send a tweet to leaders. Thirdly, COP21 is also a global Twitter event: Users from all around the world were tweeting about COP21. 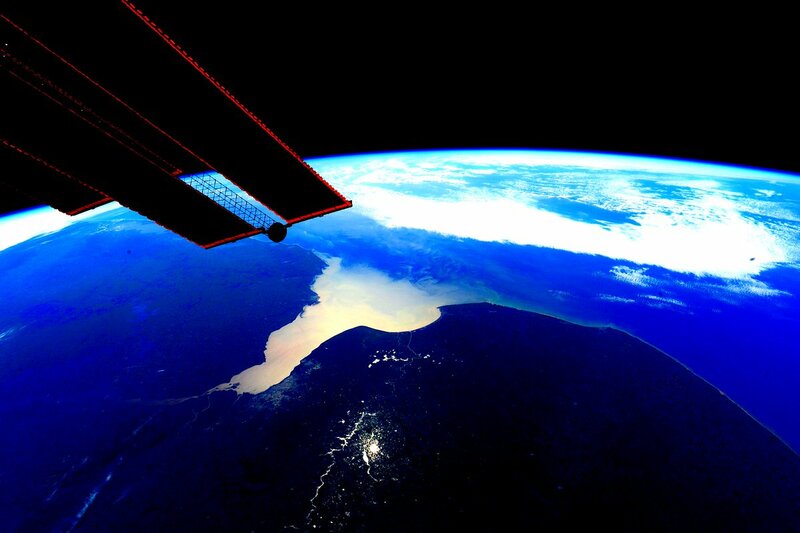 Nowadays it is even possible to send Tweets from outer space back to earth. The data collection, analysis and visualization in this blog post were all done in R.
 In my data set this was the case with #sassousi, a hashtag in reference to the Congolese president Denis Sassou Nguesso. The hashtag has been used 56’206 times by only 319 users. A good example of such a bot account is @JeVoteNon. The low number of replies in the data set can be explained with the sampling process. 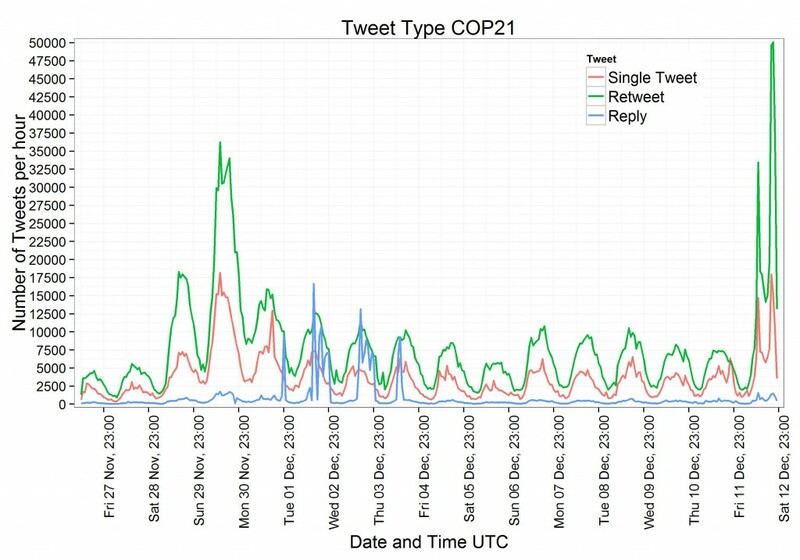 Tweets about cop21 often attracted replies but users writing replies usually did not mention cop21 again in their replies because the topic of the conversation was already clear. The same holds true for hashtags. Users use less frequent hashtags in their replies than in single tweets. WWF Indonesia for example created a page that helps to automatically generate a tweet in which a user can address a global leader. Such a page might be used for a good cause but it is a questionable practice an falls into the category of digital astroturfing. It has become accepted wisdom here that Paris 2015 is not Copenhagen 2009. This time, the US and China are on board; the price of renewables has dropped by more than half; the vast majority of countries have already pledged emission cuts and Paris is seen as a “staging post”, rather than a final destination. But in one way at least, Paris 2015 is a re-run of 2009 Copenhagen. There are a staggering 3,700 ‘media representatives’ accredited in attendance, which is just short of the 4,000 (from 119 countries) present at Copenhagen. This makes these summits some of the most reported political events to take place globally. Some say that only the World Cup and Olympics attract more journalists. The sheer volume of content which is produced on an array of platforms offers rich pickings for media scholars. But the revolution – even since Copenhagen – in the way journalists (paid or otherwise) produce news, the content of that news, and how that news is consumed throws up significant research challenges. Changes in consumption: this year’s Digital News Report from the Reuters Institute, based on interviews with 23,000 online users in 12 countries, clearly maps the rapid change in how people, and particularly those under 35, consume news. The smartphone has risen rapidly in most countries as the defining device for digital news with a disruptive impact on consumption, formats, and business models. Then you have to throw in the rapid rise of video content, the role of social media like Twitter and Facebook in finding, discussing and sharing news, and the decline of print, and we have a very different media world from that of Copenhagen just six years ago. Print is now the main source of news for only between 6% and 12% of those surveyed, depending on the age group. For how long should we bother with print? The arrival of new(-ish) players: the Digital News Report also charts the rapid rise of ‘digital natives’, based on social and mobile distribution. In the English-speaking world at least, Huffington Post, BuzzFeed and Vice are now significant competitors to legacy media brands, particularly for younger age groups. And they are investing heavily in other languages and their news gathering capacity. 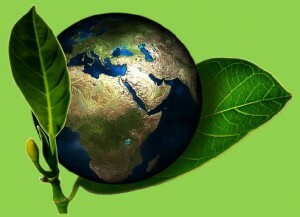 All three cover the environment and climate change extensively, but in different ways. HuffPo relies extensively on blogposts, Vice on ‘personal narration’ video, and BuzzFeed on a mix of listicles, quizzes, photo galleries and irreverent content. One challenge for researchers is how to analyse their content, when all of it is sent out via social media and is difficult to pin down via traditional search engines. Another is to assess whether these new sites verge into campaigning or advocacy journalism. The increase in niche sites: Another major development since Copenhagen is the proliferation of niche sites on the climate or green issues, which have a profound influence over legacy media as a source and agenda-setter. The list is extensive, but in the UK there is Carbon Brief, Business Green, Climate Home, the Energy and Climate Change Intelligence Unit (ECIU), some of them lead by former mainstream journalists. There are several in the USA, and many other countries have their equivalents. For the journalist, campaigner, and climate change aficionado, these are invaluable sources of information. The decline of specialist journalism in some countries’ legacy media may in some sense have been compensated by the boom in such sites. New narratives: Have the dominant narratives or frames around climate changed, and if so how? A very impressionistic take on coverage from Paris suggests that there are significantly more stories about renewables, new technologies, and business opportunities. Such stories are one indication of how media narratives about climate change may be becoming more about hope and opportunity, and less about the more traditional doom and gloom. In part, this may be due to a realization that the transition to a low-carbon economy is inevitable, even though the pace of it is uncertain. But for some media organisations like the Guardian, more messages of hope form part of a deliberate editorial policy driven in part by readers’ wishes. Sceptics and polarization: An obsession of mine I know, but one trend I am interested in is whether we have seen a polarization in the media along political lines in their editorial approach to giving presence to sceptics. It is probably true in the UK, but it may be true of the USA and Australia too. One interesting and frequent observation here is that in Paris the sceptics have become more marginal. That’s in sharp contrast to Copenhagen, when the ‘Climategate affair’ received considerable coverage, offering plenty of traction to sceptics particularly in the UK and USA. These and other issues will be addressed in a new project the Reuters Institute is coordinating in six countries about the way new players like BuzzFeed, Vice and Huffington Post are covering environmental news. This includes climate change and the Paris summit – and how these relative newcomers differ from legacy players. It should provide some insight into the ways the media landscape at Paris 2015 is indeed not that of Copenhagen 2009. 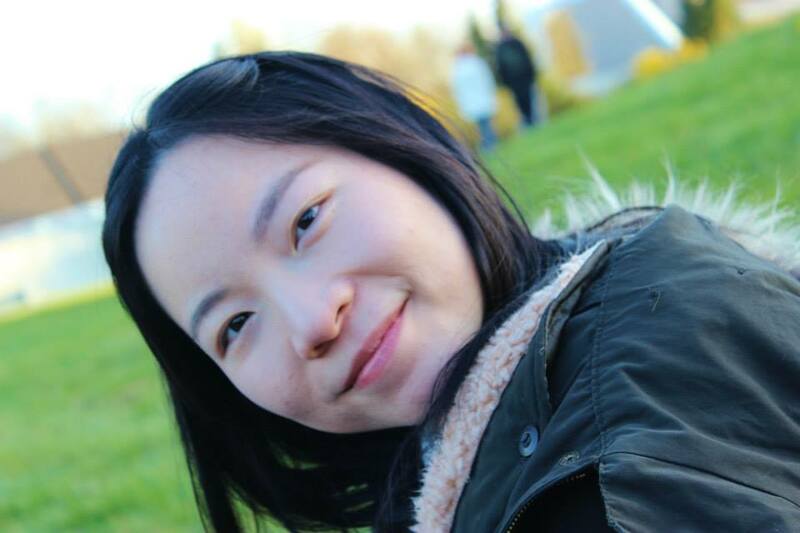 Zi is a Chinese journalist currently working towards her master’s in journalism and globalisation in Hamburg. On 11 December, CCTV posted 2 stories relating to the conference. One story titled ‘China denies rejection by ambition coalition at climate change conference’ emphasized China’s efforts on fighting against climate change by covering Chinese Foreign Ministry spokesperson Hua Chunying’s speech at the climate change conference. The other one focused on US-China relations, titled ‘Chinese, U.S. presidents exchange views on climate conference, bilateral ties over phone’. This piece stressed the successful communication between China and the U.S. over climate change issues and called for strengthening coordination to reach agreement. Compared to other mainstream media outlets, China Daily posted many more news stories about climate change. There were 18 articles related to Paris talks published on China Daily main site and China Daily USA, China Daily Europe. Nevertheless, they all focus on China’s positive attitude towards coming up with effective global solutions to climate change. In addition, most articles talked about US-China relations, pointing out that conflict should be avoided for the interests of the two countries and international community. Overall, all stories try to promote China’s positive image and emphasis China’s ‘encouraging progress’. Since CCTV, China Daily and People’s Daily are all state-run media, they often publish the same or very similar articles. Four news stories published on 11 December are also published on China Daily. Other main media outlets in Chinese language mainly report the fact that the Paris climate conference was extended by one day. Besides that, China being excluded from the high ambition coalition was a topic many of the articles focused on. During the past two weeks of the UN summit, we have read about the problems that civil society actors have faced in making their voices heard. Following on from the November 13 Paris terror attacks protests and other public events were banned in the city. 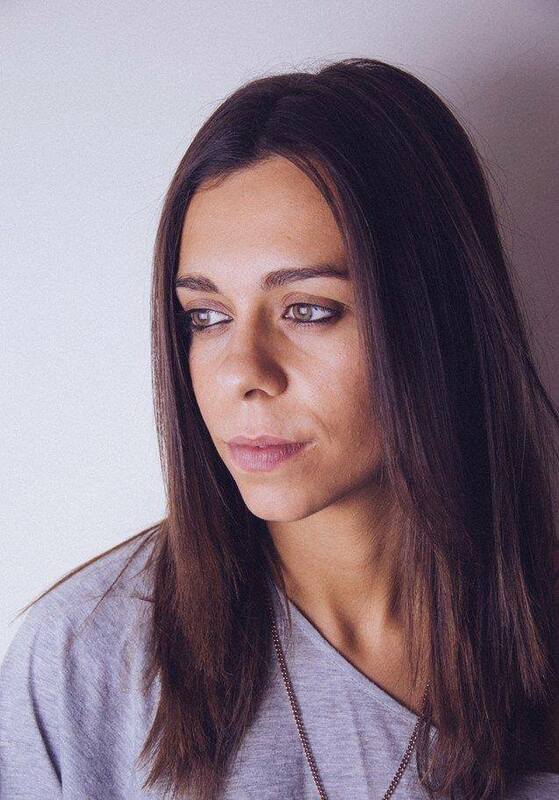 Under these circumstances, social media represent a means through which civil society organisations can stand up for what they believe in and receive public attention. In this blog post, I want to take a look at the climate change debate taking place on twitter, and the actors participating in it. 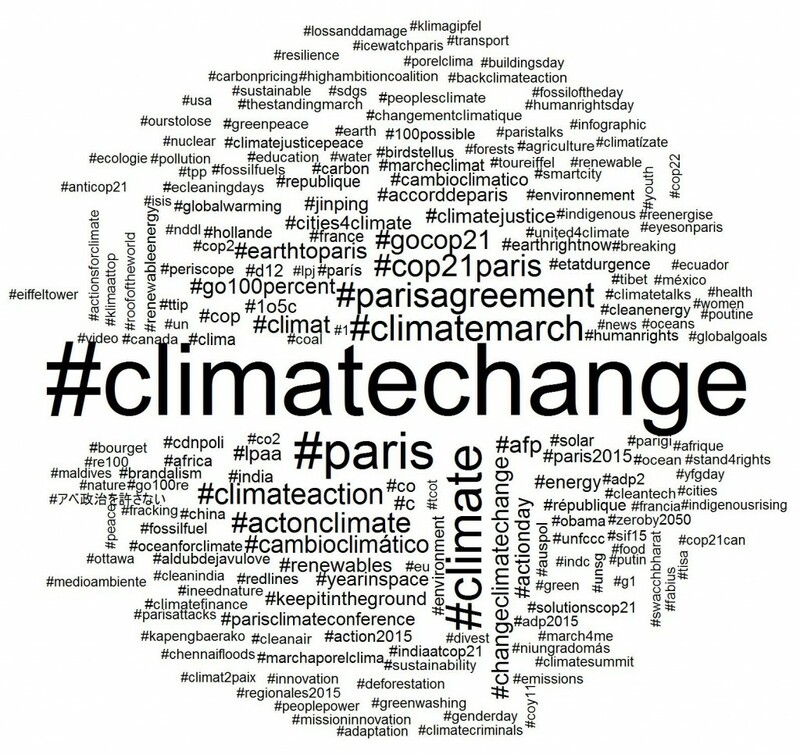 During the conference, I have collected tweets using Google Tags based on the hashtag #climatechange. The following preliminary analyses are based on tweets collected between 30th of November and 8th of December 2015. The ten most active twitter users in the sample were: MercianRockyRex, BLUEdotRegister, ClimateWise2015, Denovo777, PlantsLoveCO2, NiliMajumder, ArBolivia1, neils_rt, EcoFashion2015, CircularEco. Among the most active users, the traditional big NGOs are not to be found. 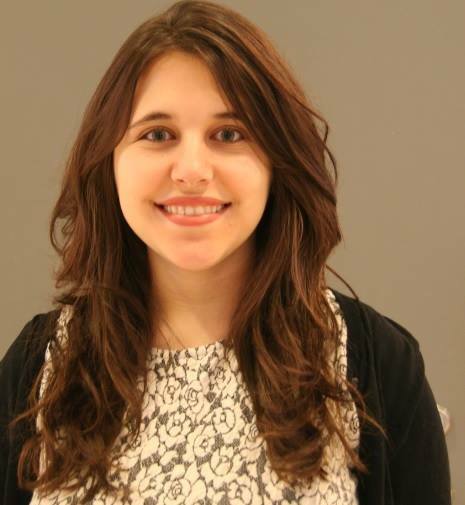 They nevertheless play an important role, when it comes to online conversations, i.e. being directly addressed, mentioned, and re-tweeted by other users. For the visual analyses below, I have taken a random sample of 10,000 tweets. 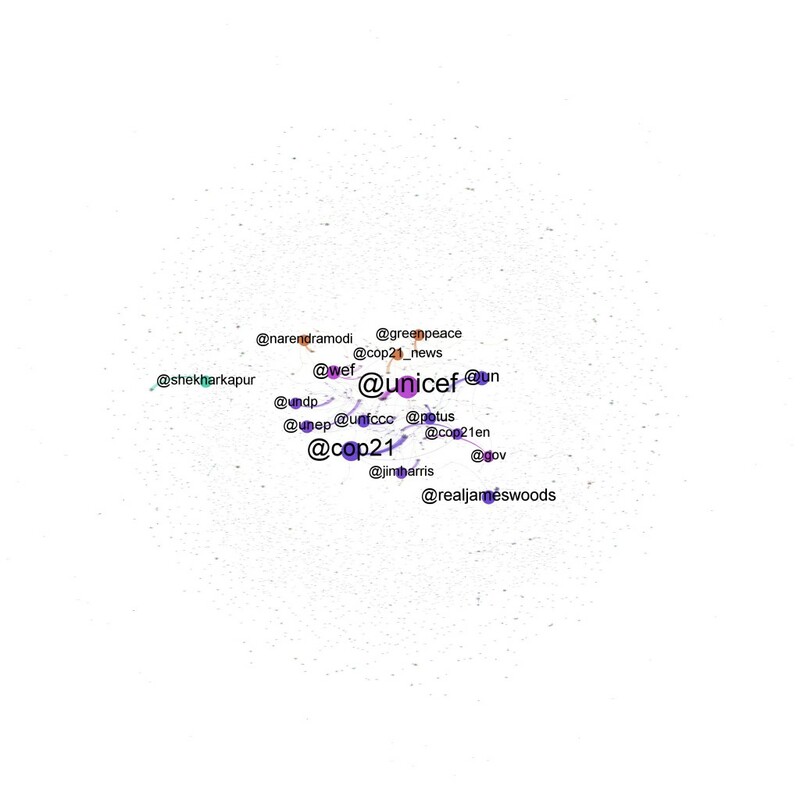 Figure 1 visualises the actor network of the #climatechange debate, highlighting the most central actors in the network. As can be seen, civil society actors have indeed been very central in the online climate change debate. Among the most central actors are UNICEF, Greenpeace, and the World Economic Forum. But it also evident there are many isolated users expressing themselves without engaging into discussions with any of the central actors. Figure 2 shows the most popular hashtags used by the users in the network above. Of course, since the data was collected based on the #climatechange, it is the predominant hashtag. Yet, hashtags calling for action, such as #climateaction, #actionday, and #climatemarch also play an important role in the debate. Of course, it remains to be seen to what extent the social media activity of civil society actors has an impact on the outcome of the UN summit. However, during these last days of the conference, it has been civil society organisations, voicing the view, that the current options are insufficient. As of last night Paris time, a deal was struck by nearly all nations represented at COP21 to limit warming to under 2C from preindustrial levels. 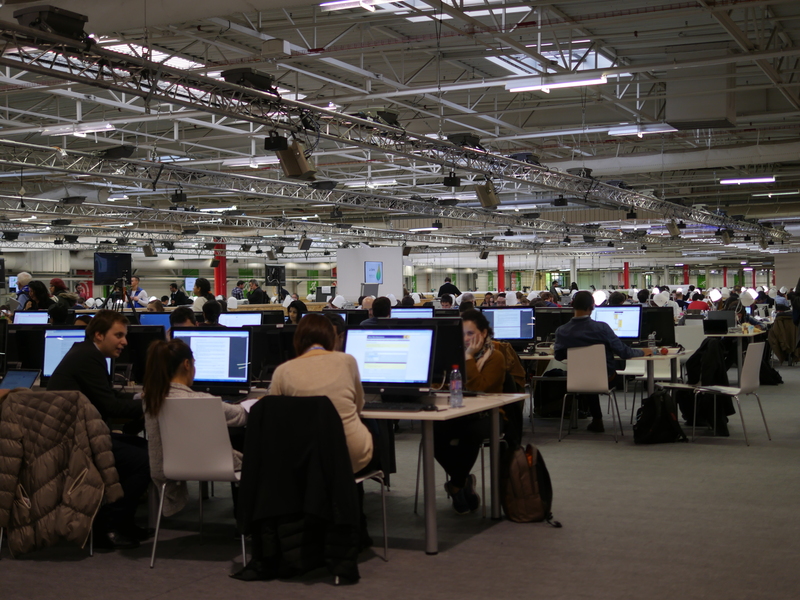 As the COP 21 comes to an end, the main focus of the coverage of Spanish and Portuguese newspapers on Friday (Dec 11) was the announcement that the release of the final agreement had been postponed. 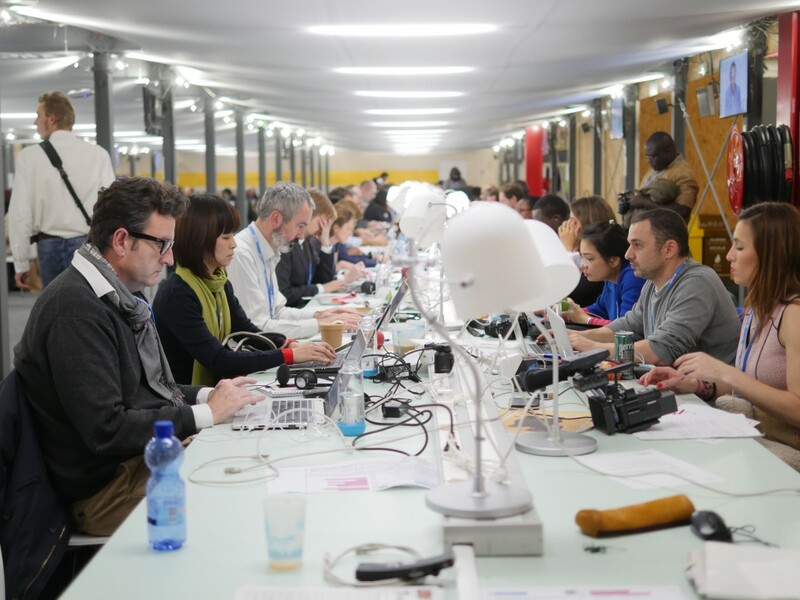 Prominent newspapers from each country El País, El Mundo (Spain) and Público (Portugal) had correspondents at the Summit, while others used texts from news agencies. 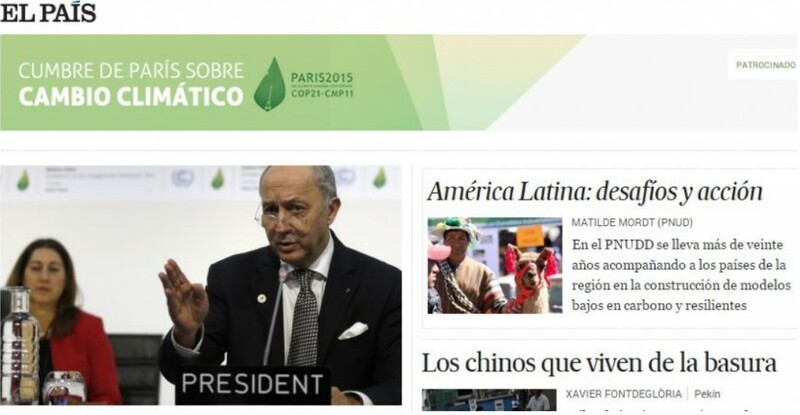 In Spain, El Pais had an exclusive section of its online edition dedicated to the coverage of the Climate Conference, while El Mundo featured articles under a tag “Climate Change”. Both outlets portrayed headlines highlighting the pressure for a final draft of the agreement to be achieved soon, as well as more analytical and opinion articles about climate change. El Mundo shared stories raising the opinion of experts and journalists specialized in the field, while El País gave space to people and organizations to write stories on the matter. An example is a piece published by the UN Development Program focusing on Latin America and the challenges posed by climate change. ABC (Spanish version) focuses primarily on the agreement that is about to be released. A characteristic that could be identified in ABC’s coverage is a prominent European perspective. This can be seen in articles relating to European standards of carbon emissions and interview with EU Commissioner for climate action on the expectations for the final agreement. 20 minutos (Spain) also portrays the climate conference as a special section of its online version. The newspaper does not have analytical or opinion articles, focusing mainly on the events happening in Paris, both inside the meeting rooms and outside, for example it published stories on protests taking place in front of the Conference’s building. A distinctive factor in regard to Spanish coverage is that both outlets featured stories with scientists and experts point of view in relation to the agreement, also adopting a more critical view of the goals established by the document. In Portugal, daily coverage of the Conference can be found in newspapers Público and Diário de Notícias. 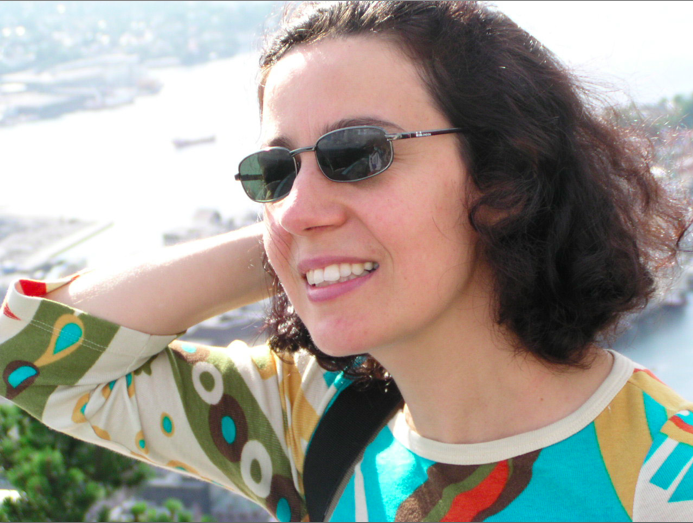 Público had an editorial questioning the goals set by the countries, and Diário de Notícias published an article where scientists defining as “inconsistent” the first draft of the agreement stating that it does not establish proper goals that would be able to tackle climate change. As the climate negotiations in Paris near their final rounds, some might be surprised by rather contradictory developments, which relate to the much discussed 2 degree threshold. 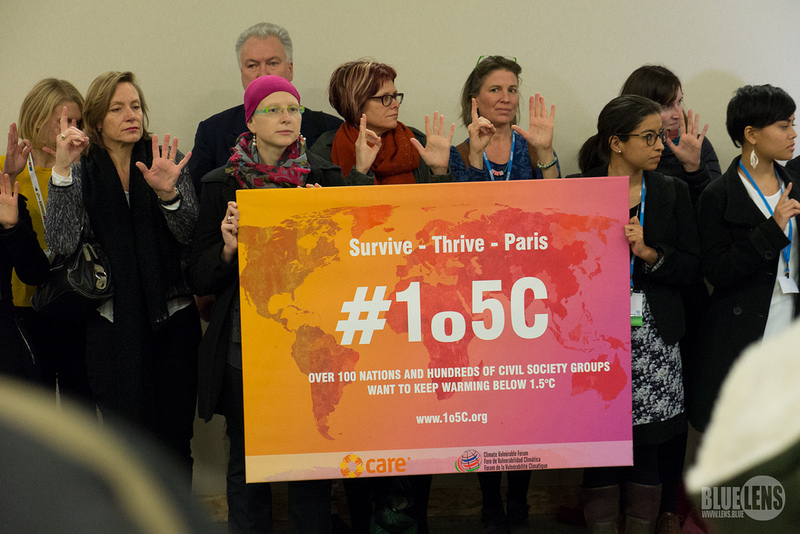 This limit aims to keep warming within 2°C of the pre-industrial average.While the emissions reduction pledges put forward by the countries ahead of COP 21 in Paris were not sufficiently ambitious to keep within this limit, in the final phase of the negotiations many countries wish for an even lower limit: below 1.5 degrees. This comes at a time when two separate new studies in Nature Geoscience and Nature Climate Change challenge the 2 degree threshold. 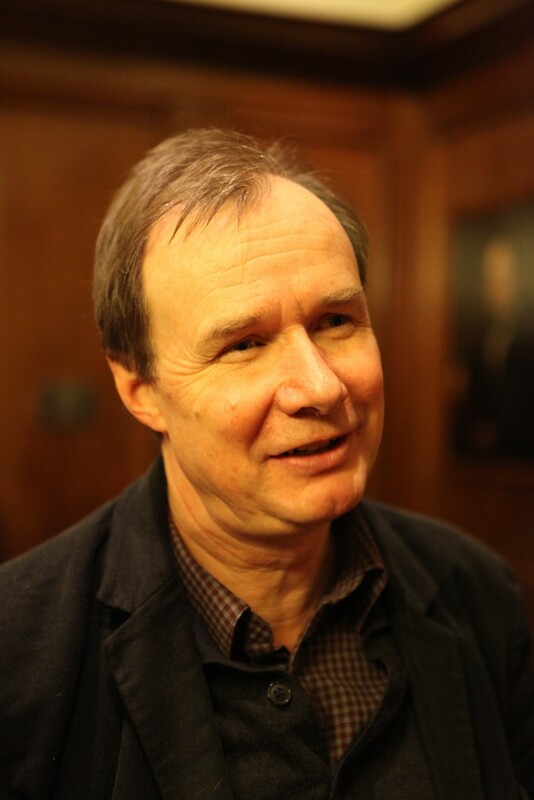 Reto Knutti (ETH Zurich, Switzerland) and his colleagues argue, that “no scientific assessment has clearly justified or defended the 2 degree target as a safe level of warming, and indeed, this is not a problem that science alone can address.” The authors have in fact said, that 2 degrees was a “value judgement”. The term value judgement indicates that the scientific evidence is not the only factor at play when deciding a warming limit. With this in mind, it might be interesting to look at some findings of a recent study conducted by our Centre for Political Communication at Zeppelin University on the Framing of 2 degree in German Media during and after the Copenhagen Summit in 2009 until 2014 . Expectations to reach a global 2 degree agreement were very high in the run-up to Copenhagen. That made perceived failure of this summit even higher. With a content analysis of the coverage of 10 German news outlets from 2009 until 2014, we detected almost a third of all 1189 articles were published during the 2009 Copenhagen summit. After this peak, coverage steadily declines, except for some small peaks during the following summits. After Copenhagen these conferences are no longer seen as effective instruments to deal with 2 degree limit. We also could detect that the original positive assessment of 2 degrees in the media vanishes. Negative ratings are stable, but indifference and climate fatigué spread. 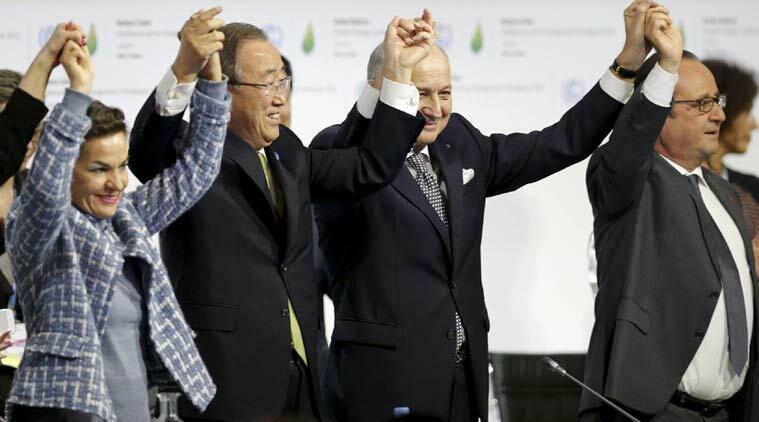 Politicians backed away from the 2 degree debate after the failure of Copenhagen. 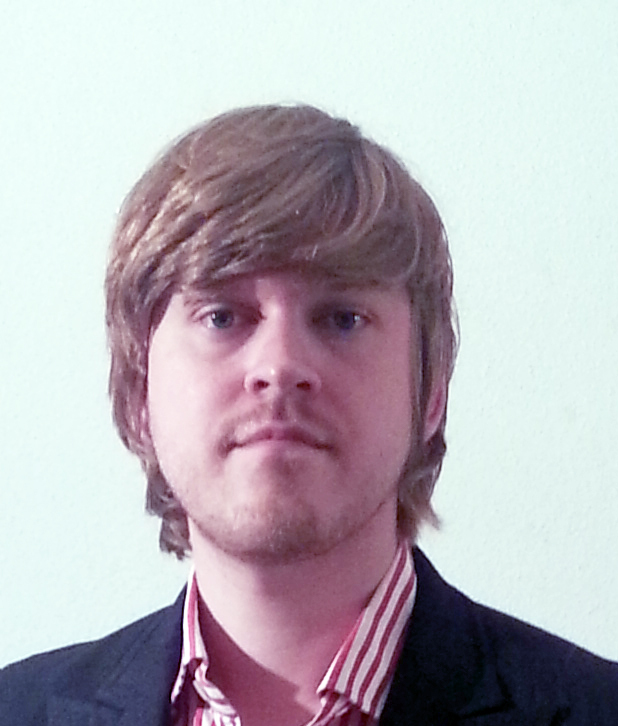 German political factions in the Bundestag rarely speak about the issue. A real German debate is missing, except for some advances by the Federal Ministry of Environment and the German Chancellor. By looking at the framing of the debate we could spot that 2 degree is primarily interpreted as an issue of achievability. Other prominent frames deal with the definition of the 2 degree limit and climate diplomacy. Achievability is defined by measures to achieve, by the possibility to achieve and by the necessity to achieve. It is also being used most frequently over the time and is combined with the demand that in order to stay within the limit emission reductions are needed. The achievability frame is being used most frequently over the time and rises when the coverage on 2 degree increases. There’s also no hierarchical change within the frame usage over the time; both politicians and scientists address the achievability. While politicians refer to the issue, its necessity and the measures that must been taken, scientists assess the possibility and evaluate it is as hardly achievable given the current policies we have in place. Keeping these results in mind, it is quite remarkable, that some politicians came up with a goal that is even more ambitious. We are very interested to see not only the results from Paris but also from the findings of our Framing study on the coverage of the Paris summit. Note: I’d like to thank my colleague Jonas Kaiser with whom I conducted this study. From the beginning of the Paris Climate Summit, the world has expected a global agreement to cut greenhouse gas emissions and tackle climate change. Carbon pricing is seen as part of the solution. Carbon pricing is the cost applied to carbon pollution to encourage polluters to reduce the amount of greenhouse gas they emit into the atmosphere. While no global carbon pricing policy has yet been broadly agreed to, the private sector is doing their homework. The scene has so far been dominated by negotiations about government commitments to reduce their carbon emissions. But there are other actors that are seeking to play a bigger role in the green economy transition: multinationals. Countries and companies are more and more aware of the fact that polluting is not (or it should not be) free. The Carbon Pricing Leadership Coalition at COP1 is evidence of that. In fact, according to the World Bank, around 40 national jurisdictions and over 20 cities, states and regions, have adopted carbon prices, covering about 12% of global greenhouse gas emissions. These carbon prices, which come mostly as taxes, have increased three-fold over the past decade. Now, even crucial actors like China are expected to launch a national carbon market within four years. In this context, even it is yet unclear whether an agreement in a global carbon pricing will be agreed upon soon, preparations are already underway in several companies. 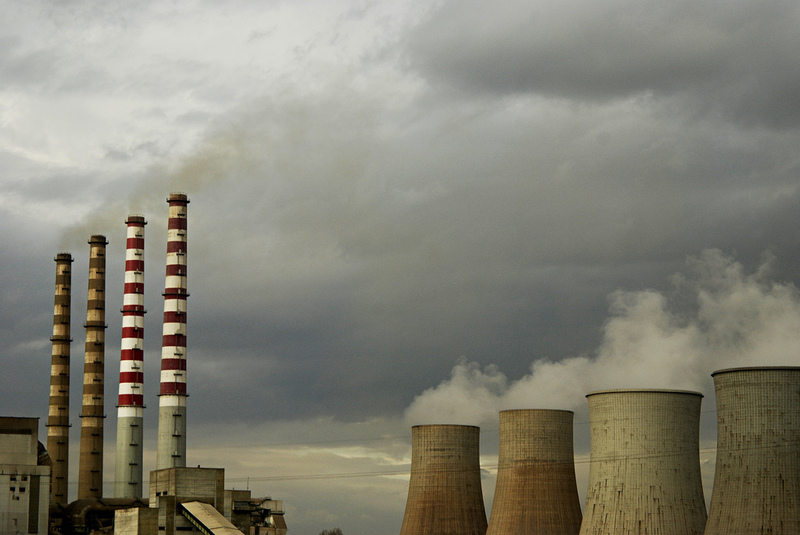 What’s more, corporations are incentivizing action on carbon reductions. Last June, six leading oil and gas companies called energetically for a framework that encourages global carbon pricing, saying this would be the most effective way of cutting the emission of greenhouse gases. The Carbon Disclosure Project, a not-for-profit organization that works with 822 institutional investors with assets of US$95 trillion, has been witnessing this trend for years. 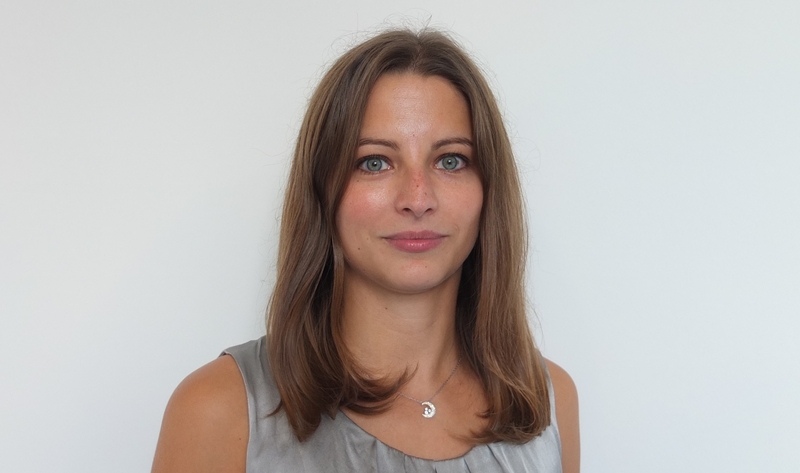 According to Kate Levick, director of policy and regulation, “An agreement in Paris which sets out a long term decarbonisation goal will inevitably lead to a greater interest in carbon pricing”. For her, the willingness is already there. “Expectations of disclosure and transparency for companies have been growing steadily for more than a decade. This accountability and ability to measure/manage is one of the underlying trends which has led to the real paradigm shift – that we now see a tipping point of companies prepared to take ambitious action on climate change in preparation for the transition to a 2 degree world”. The 2015 report on carbon pricing from CDP, showed that 437 companies reporting using internal carbon pricing to gauge their risks and costs. The number increased from 150 companies in 2014. Moreover, 638 companies report that they recognize that carbon regulation presents business opportunities. The internal carbon price is voluntary but is used mostly as a financial planning tool. They can range from $20 per ton in the US to $150 per ton in Sweden. In some cases corporations use a much higher price than the one they currently have to pay in places with a government-mandated carbon pricing scheme, such as the EU’s emissions trading system, the world’s largest carbon market. There is no secret that more and more CEOs are buying the idea that pro-active disclosure of impacts and steps to address them would raise the recognition and stature of companies in the eyes of consumers, governments and shareholders. As the Huffington Post article Carbon Pricing and Investor Momentum: Game Changing Convergence and a New International Financial Language recalled “as investors become more attuned to minimizing environmental risks, and put together more environmentally favourable portfolios and funds, carbon pricing will concomitantly become a new factor to help decision-making”. Mohan Kumar, lead researcher of Price Carbon Now!, a Canadian organization said: “Being socially responsible would lead to cost savings, innovation, brand differentiation, and customer and employee engagement”. Also, it’s estimated that, on average, companies that voluntarily report their carbon emissions can save $1.5 million every year in interest repayments. In contrast, non-disclosure may result in penalties, loss of revenue and a tarnished reputation. Companies generally tackle climate change in three ways: firstly, make emission reductions. Secondly, publicly disclose emissions reduction targets and finally invest in emissions reduction projects with positive returns. As Kumar remarks, many industries have already supported and/or adopted a shadow carbon price, which is the voluntary use of a notional market price for carbon in internal corporate financial analysis and decision-making processes. 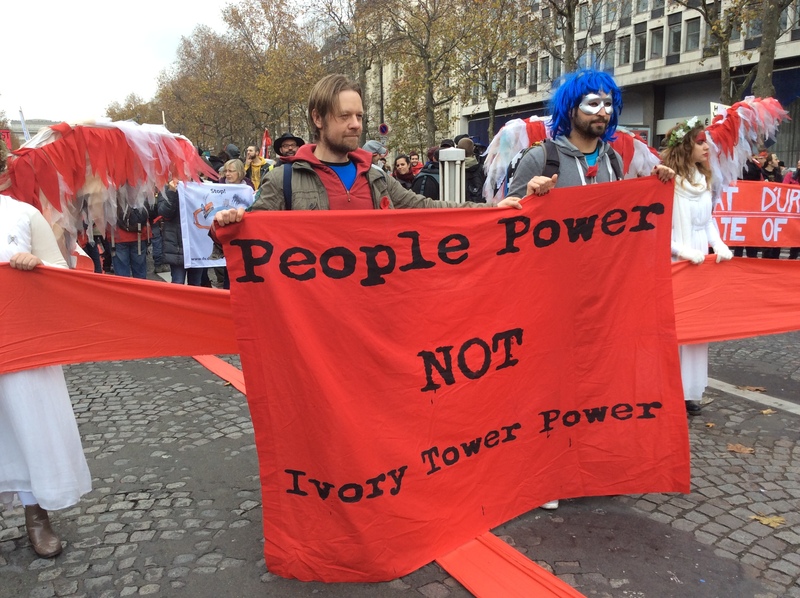 Others are calling for system of tradeable permits, known as cap and trade, this has had echos in Paris. There is still a long way to progres in this field but the experts agree that the next step is governments providing a clear, stable, and long-term policy framework to encourage companies to keep reducing carbon emissions.